I ran out of the right wire so I used 10 gauge speaker wire for EVERYTHING. Except for the sub amp’s power cables. 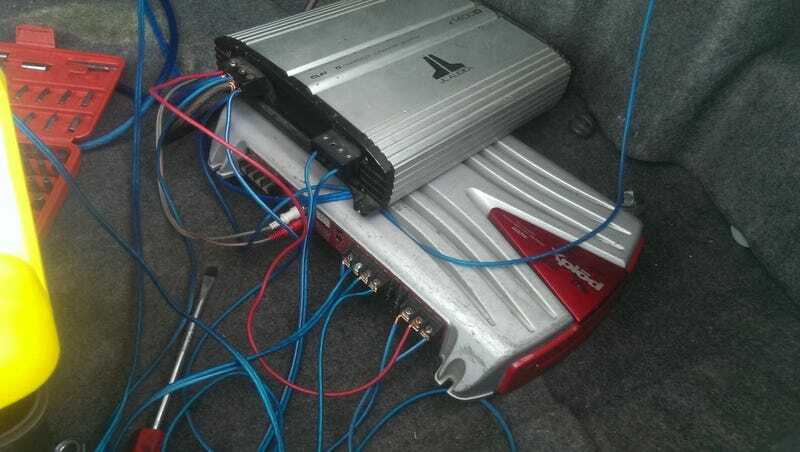 Luckily the JL amp has a passthrough so I can get RCA to the sub amp and the rear channel. Gonna need a splitter to get RCA to the front channel, but honestly this hodgepodge of utter horseshit sound really good if I just plug my phone into the RCA jack through an adaptor. I got some $20 Walmart head unit but there’s an obscene amount of engine interference through it. Might see if I can put a ground filter or something on it. EDIT: Let’s count the sins. 2. Amps are loose in trunk. 3. Inappropriate wire gauges. I doubt that Xplod draws anywhere near the power it says but that thing needs 8 gauge.